Top-notch Reliability and Service... At Amazingly Affordable Rates! 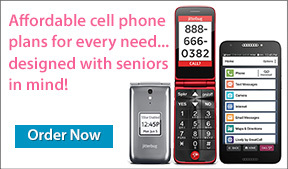 The new Jitterbug Flip cell phone makes staying in touch a pleasure again. Itâ€™s easy to see and hear, super-simple to use plus itâ€™s surprisingly affordable. Jitterbug Customer Service Many customers buy their Jitterbug cell phone because itâ€™s a simple, affordable cell phone...then stay because of the great service. Friendly, USA-based operators and customer service representatives are available around the clock to help with anything you may need. They can explain how to use your phoneâ€™s features, help you make changes to your account or even dial a phone number for you like operators did in the old days! In addition to a great phone and great service, youâ€™ll also get free services like My Phonebook to help keep you organized. Thereâ€™s even a Daily Health Tips feature made just for seniors. It's inevitable... sometimes life just happens. With the 5Star Urgent Response service, you don't have to be alone when unforeseen events arise. Whether youâ€™re experiencing a medical issue, unfamiliar with your surroundings, or just need someone to stay on the phone with you while you walk to your car at night, 5Star can help. Certified 5Star Agents are available 24 hours a day!